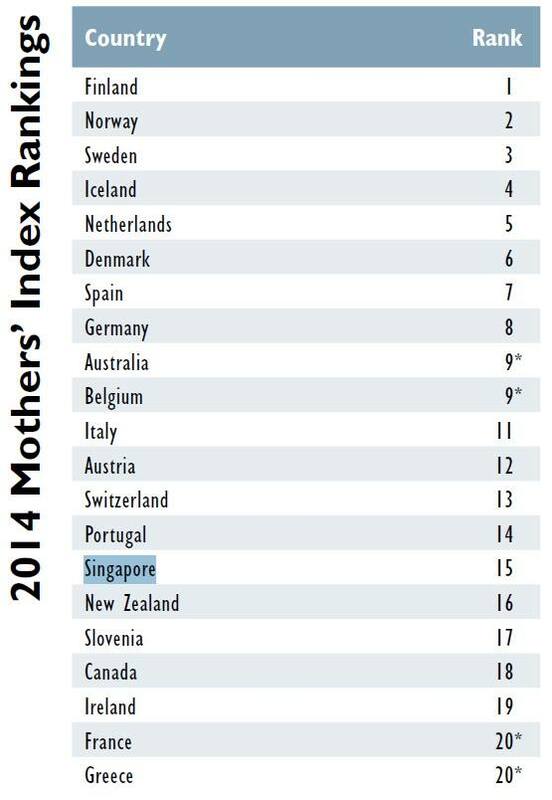 Singapore, the best place to be a mother. Really? We were actually number 15 globally in this table based on a study by “Save the Children.” The article assumes that Australia, which was at number 9, is not part of Asia. It goes on – you can go to their Facebook post to see all the comments – good and bad. Personally, I thought it was odd that we were ranked the “best place in Asia to be a mother.” When I read CNA’s article, I came to the realisation that the context was not painted adequately. The “Mothers’ Index” by Save the Children is derived from health, educational and economic factors. Their work seems aimed at developing countries where women’s mortality, safety, and economic progress are major issues. These are not issues faced by developed nations like Singapore. “In Singapore, lifetime risk of maternal mortality has been cut by 80 per cent, child mortality decreased by 25 per cent, gross national income per capita doubled and percentage of women in parliament increased six-fold over the past 15 years, the report noted. So the foremost issues that concern the organisation seem to be mortality, economic and leadership progress of women. My hunch is that the issues that make being a mother in Singapore challenging are our education system, time with child, stress, and money (lower and sandwiched class). These do not seem to be measured in the study. The headline, “Singapore best place in Asia to be a mother,” in my view, is a sweeping generalisation. Yes, it is true based on the study but a wider context to frame this statement would have been more accurate. For example, “Singapore best place in Asia to be a mother” with a sub-head that clarifies that it is based on mortality, economic progress, etc. The article could then elaborate on issues Singapore mothers face. This sweeping headline will no doubt create much debate and conversation online. Oh wait, that could have been the intention. In which case, ignore all of this. Watch this fabulous Guinness Ad before they take it down very soon. Static image, supers. No moving images, no voiceovers. But riveting and nicely, nicely done. Well done again, Guinness. The spot is on YouTube for now, but Guinness will remove it from Youtube on Wednesday. That’s because Guinness is not an Olympic sponsor and cannot air advertising featuring Olympic athletes between Jan. 30 and Feb. 26.